One interesting aspect of early song creation and distribution were the ballads written about bushrangers, the Australian version of the highwayman. Several songs were composed to ‘celebrate’ the exploits of the men (and they were all men) and especially ‘the Wild Colonial Boy’ Jack Donahoo (spelling varies in the versions). This particular song gained extremely wide circulation and is still sung today. It came to represent the rebellious spirit of the era and the skill of men who could survive ‘against all odds’ in the wild Australian bush. Maybe not surprisingly the majority of songs written and sung about the bushranger fraternity were very supportive of their exploits and most pointed to police persecution as one of the chief reasons behind their status as criminals. Many expressions in our colloquial language can be traced back to this sentiment including ‘game as Ned Kelly’ and ‘fight but never surrender’. One of Australia’s most famous folksongs, also well-known in Ireland, Britain, Canada and the United States. There never was a Wild Colonial boy, but it seems that there should have been, going by the frequency with which the song has been collected, here and abroad. This has led folklorist Hugh Anderson to argue recently that the song may have been composed outside Australia. And we’ll scorn to live in slavery, bound down with iron chains. And through Australia’s sunny dime a bushranger did roam. And a terror to Australia was the wild Colonial boy. With a heart that knew no danger, no foeman did he fear. Who trembled, and gave up his gold to the wild Colonial boy. Or else you may turn outlaw, like the wild Colonial boy. Three mounted troopers rode along — Kelly, Davis, and FitzRoy. They thought that they would capture him — the wild Colonial boy. He drew a pistol from his belt, and shook the little toy. “I’ll fight, but not surrender,” said the wild Colonial boy. And in return from Davis received a mortal wound. And that’s the way they captured him — the wild Colonial boy. From Old Bush Songs. Paterson was sent a number of versions while compiling the original Old Bush Songs, as he mentioned in his notes to this song: It will be noticed that the same chorus is sung to both “The Wild Colonial Boy” and “Bold Jack Donahoo,” Several versions of both songs were sent in, but the same chorus was always made to do duty for both songs. 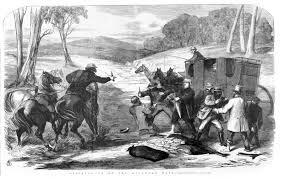 The Wild Colonial Boy’s spirited defiance of the police and his robbing of the judge are squarely in the strong folk tradition of the outlaw hero, as is the final shootout with the troopers.